These stoneware crocks are made in America and glazed by hand. 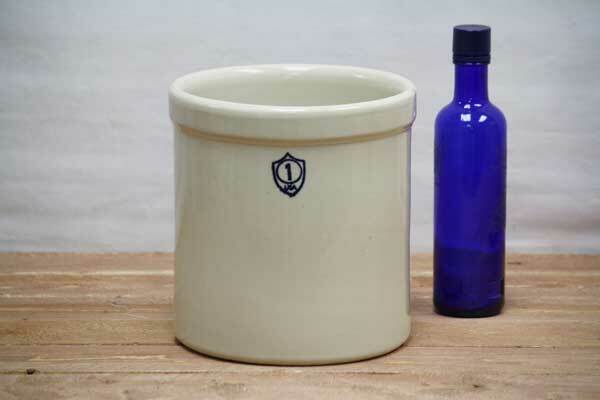 As decorative as they are practical, pickling crocks are sturdy, stable and made to last. Pottery crocks can be filled with cabbage or cucumbers and stored in a cool, dry place to spark natural fermentation, or used as a kitchen or pantry container. These earthenware crocks are made with a food-safe, lead-free glaze that's chemical free and are dishwasher, microwave, and oven safe. Stoneware crocks are easy to clean. Select from six stoneware crock sizes. We also stock fermentation weights, wooden crock lids, and stoneware crock lids for each crock size. Cultures since before the Romans have been making fruit cider, brandy, sauerkraut and other fermented foods. At turn of the 20th century these stoneware sauerkraut crocks were used to make pickles across America. The hundreds of stoneware fermenting crock recipes worldwide testify to humans longstanding appreciation for the power of well-managed bacteria to turn fresh food into safer, more durable, and perhaps more healthful foods. arrived in great condition and in two days! Shipping was worth it for these beautiful stoneware crocks.